We’ve all heard the phrase “the more, the merrier.” The same can be said about the newest trend in wedding jewelry: stackable wedding rings. You can upgrade the way you showcase your engagement and wedding rings with this fashionable and meaningful trend. While this trend may seem new to many of us, stackable wedding rings are the standard for many countries around the world. In Scandinavia, it’s common for a woman to have three rings on her left ring finger. These rings symbolize engagement, marriage, and then motherhood. The symbolism that stackable weddings represent adds to the appeal. While stackable rings are eye catching, there’s a lot more to this trend than meets the eye! An obvious reason for stacking is that it’s very stylish. Stacking and layering jewelry is a trend seen on many runways. You can showcase your personality and style with different metals, gemstones, and width of rings. 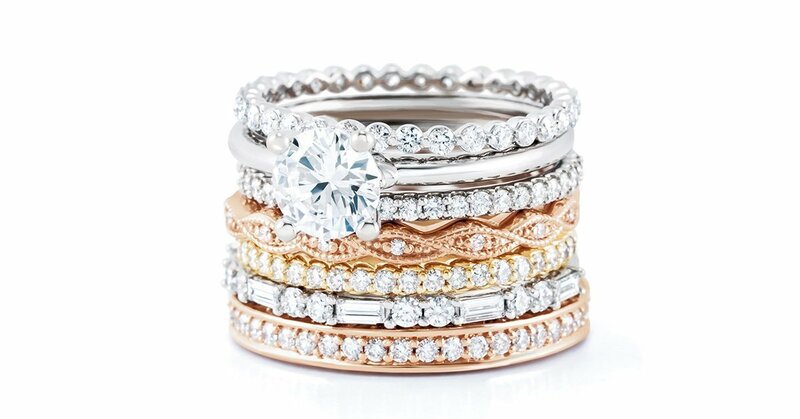 Stackable wedding rings can be rose gold, pavé, vintage-inspired, or even classic platinum. Grouping rings together can add even more sparkle! Another reason many choose to chose to stack is the symmetry that it entails. The most common way to stack is to have three or five rings, with the engagement ring in the middle. This symbolizes that your love is “sealed in” and it’s aesthetically pleasing to have the largest, prominent ring in the middle. The most meaningful part of choosing stackable wedding rings is that they tell your story. As mentioned before, life’s big moments can be remembered by adding another ring to your stack. Great times to add a ring include anniversaries and the birth of a child (often called “push presents.”) Stacking can start on your wedding day and begin to tell your “love story” with every ring you add. Now that you know why you should stack, it’s important to know how to create your own stack. 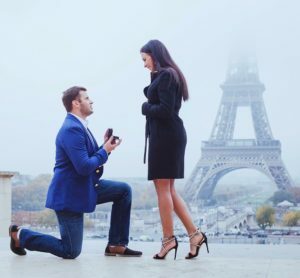 Your engagement ring will determine how you stack. 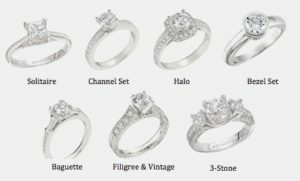 Depending on the size and style, it’s important to choose rings that complement your engagement ring. Bigger engagement rings can mean smaller, skinnier wedding rings or less rings in your stack. If you feel like your left ring finger is getting overwhelmed, you can always add rings to your right ring finger to balance it out. Balance is so much more important than matching when it comes to stackable wedding rings. Rose gold wedding rings are a great option when you want to mix metals. You can experiment with different widths of rings too! Don’t focus on making every ring identical. Having complimenting and unique rings makes your stack stand out!